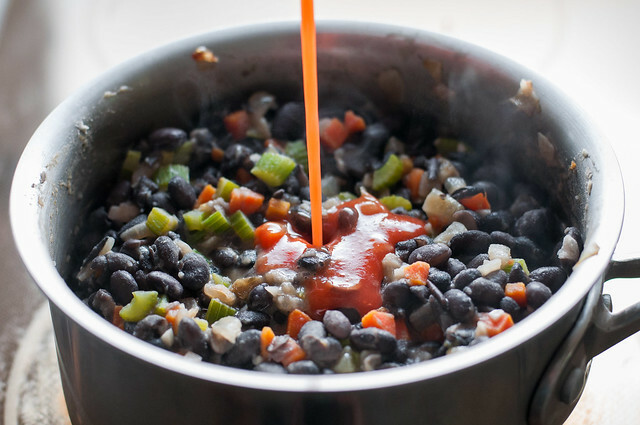 In homemade how-to number 8, I showed you how to cook your own beans for a huge savings over the good canned beans. 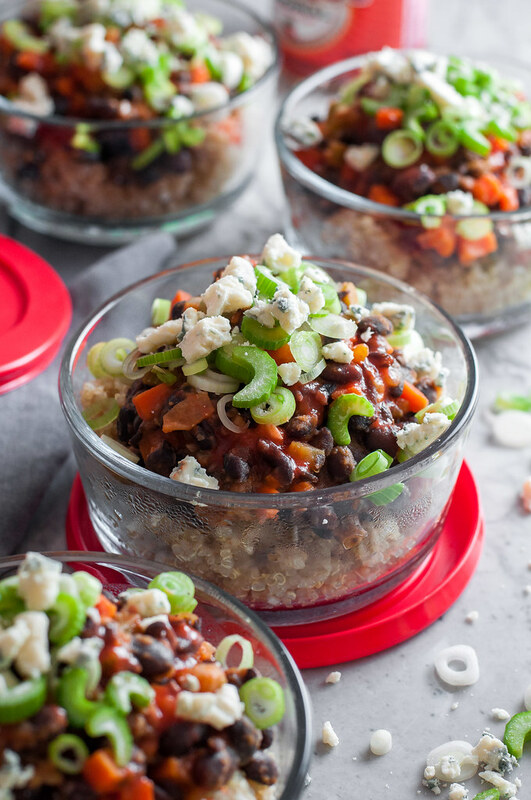 Today it’s time to put beans–black, white, or otherwise–into some spicy meatless make-ahead buffalo bowls! What are we making with all those tender, perfect, homemade beans you just cooked from scratch? 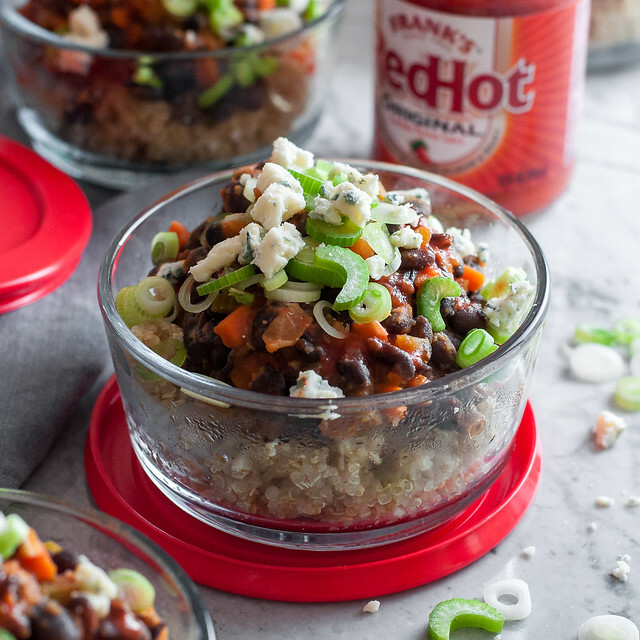 Garlic quinoa buffalo bean bowls! There are a few lingering meat recipes on NCK, like the buffalo chicken and garlic quinoa bowls, and it’s time to start converting them over to meatless versions. Today’s spicy buffalo bowl is a marriage of the recipe I just mentioned, and the sad, pictureless post about spicy black beans. The recipe for the beans is to die for, but it doesn’t get much love because I still haven’t taken any pictures of it. We’re making all that right today, with a bowl involving quick cook times that also does really well made ahead and is full of unique buffalo flavor that, personally, I crave even more in the summer. 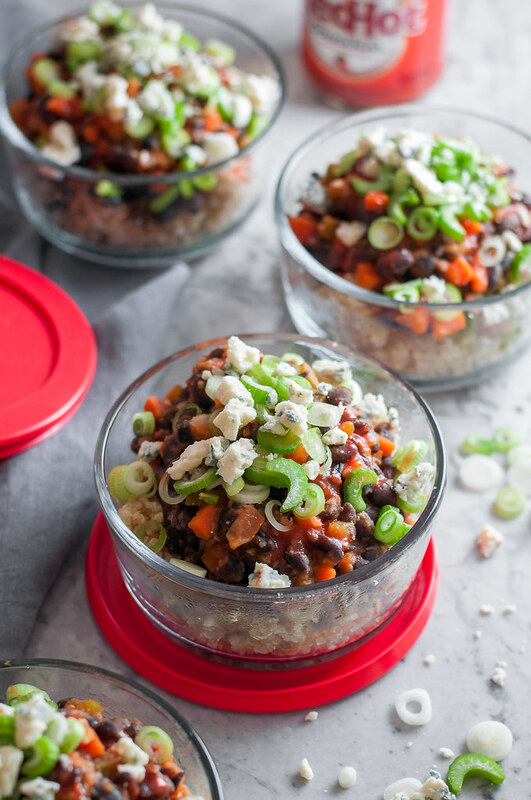 You could pack these quinoa and bean buffalo bowls up for lunches to go, or even for dinner on the run if you’re super busy. I like to warm them up before eating them, but if it’s scorching hot out or you literally have zero time, they’re decent when eaten after standing at room temperature for a half hour or so. Feel free (like you need my permission) to use other bean varieties, and really, I’m not gonna judge if you use canned beans, which is why I include the quantity conversions in the recipe. White beans would probably look a lot like the aforementioned chicken bowls, with the bright hue of the buffalo sauce on full display. I used black beans here for a bit of contrast in the pictures, and, oh, because I have 10 cups of them in the freezer. With that in mind, can we have a little unofficial tip session about summer cooking? Summer is coming up and I have several friends who have recently had the cutest babies ever. Perhaps that’s why so many conversations lately revolve around food, and how to really cook efficiently for a busy family. It’s weird for me to think of myself as any kind of authority on cooking for a family or cooking healthy, but I’m trying to embrace the rapport and experience I’ve built, all the time I’ve spent learning and experimenting, and offer the best advice I can when asked. One tidbit I recently found myself sharing is that planning meals for the week is way easier when you do it in the kitchen–yes, literally standing in it–with your pantry and fridge in front of you. Why? Most of you reading this are probably fortunate enough to keep an inventory of food in your home, or you at least have the means to do so. So as you plan, look at what you have (like my black beans stock pile), and pick out two or three ingredients you have a lot of. Then plan a dinner (or breakfast or lunch) around each. Other examples would be my ever present stash of polenta, which I can transform into tamale pie or a simple breakfast bowl, or an ignored block of cheddar, which can become quick quesadillas with a pack of tortillas and a few veggies or beans (or meat). It’s actually kind of a fun challenge to see how much I can clean out the pantry before going on a full-out grocery shopping trip. It would be interesting to get a conversation about meal planning going down below in the comments, so let me know if you’ve ever employed my strategy, or what methods you swear by when it comes time to plan dinner (and, let’s be real, breakfast and lunch) for the week. I’m also going to be more faithful about Instagramming recipes from my dinner plans, so hop on over to the ‘gram if you’d care to follow along! Gluten free/vegetarian. 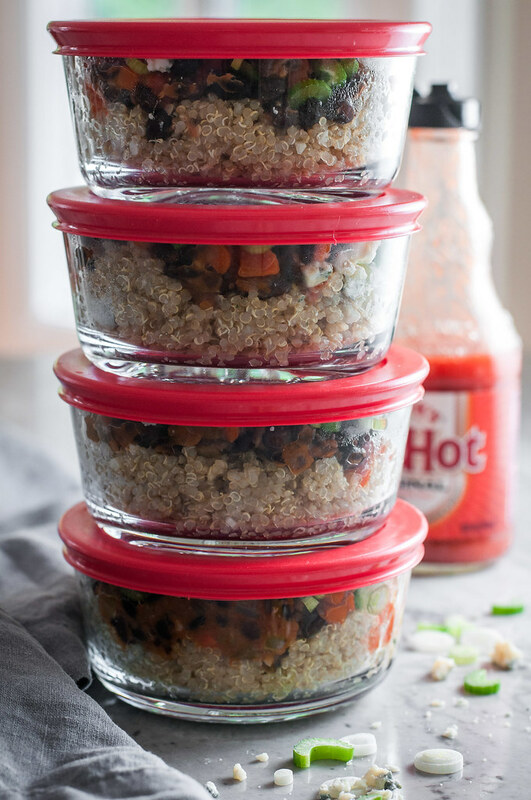 Prep the ingredients for the beans while you cook the garlic quinoa, and you have super quick, fun, and healthy lunches to look forward to all week! Make the quinoa. Heat 1½ tablespoons oil or butter over medium heat in a 2 quart (or larger) saucepan. Add 4 cloves minced garlic and stir constantly until it turns light golden. Add the quinoa and stir for another minute or two, to toast. Add 2¼ cups water and a pinch of garlic salt, increase heat to high, and bring to a boil. Reduce heat to maintain a simmer, and cook for about 15 minutes, until the quinoa is tender and has absorbed all the liquid. Stir in 1 teaspoon garlic salt and the pepper and distribute warm quinoa amongst four bowls or to-go containers. Make the beans. Heat 3 tablespoons butter or oil over medium heat until melted or hot. Add onion, celery, and carrots, increase heat to medium high, and cook, stirring often, until well browned. Add garlic and cook 15 to 30 seconds. Add beans and 1 cup water and reduce heat (probably down) to a simmer. Cook 5 to 10 minutes to reduce slightly, smashing some of the beans with the back of a wooden spoon as they cook, to thicken. Add hot sauce and simmer another minute or two, then season to taste with 1 teaspoon salt and a pinch of garlic salt. Divide beans amongst bowls with quinoa. To serve or store, top with blue cheese, scallions, and extra chopped celery. Keep in the refrigerator for up to five days, or freeze without the celery and scallion topping. 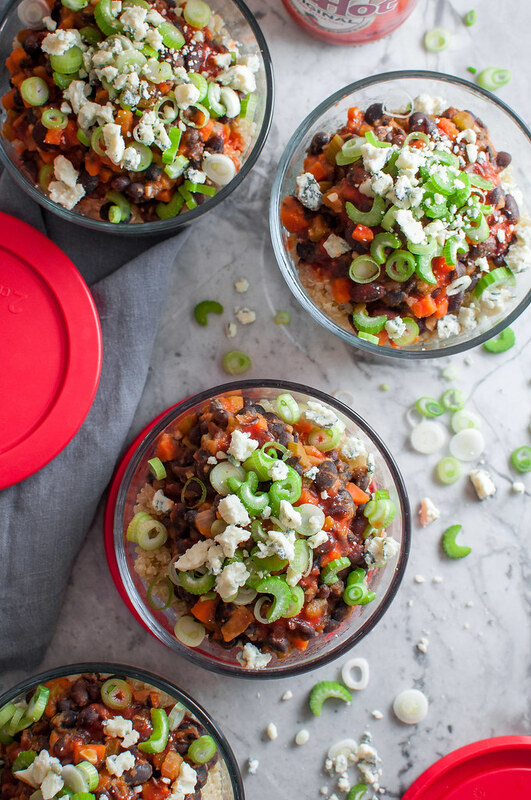 Recipe inspired by my 4-ingredient spicy black beans and buffalo chicken garlic quinoa bowls. If you don't have onions, carrots, AND celery, just use 2 cups total of just one or two of them. 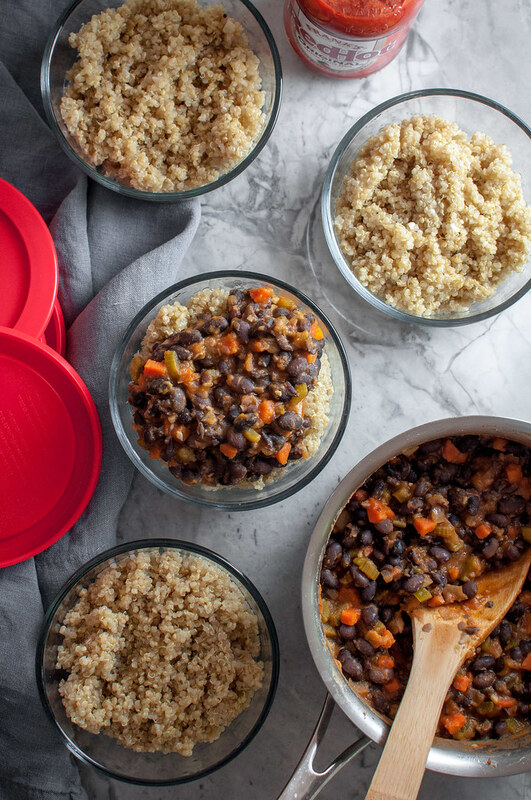 For speedy prep, get the bean ingredients ready while the quinoa cooks. Note: This page contains affiliate links. It does NOT contain sponsored content. Affiliate links (to products I recommend, on Amazon) offset my ingredient and website maintenance costs, so I can keep bringing you spicy recipes like this one. Thanks!